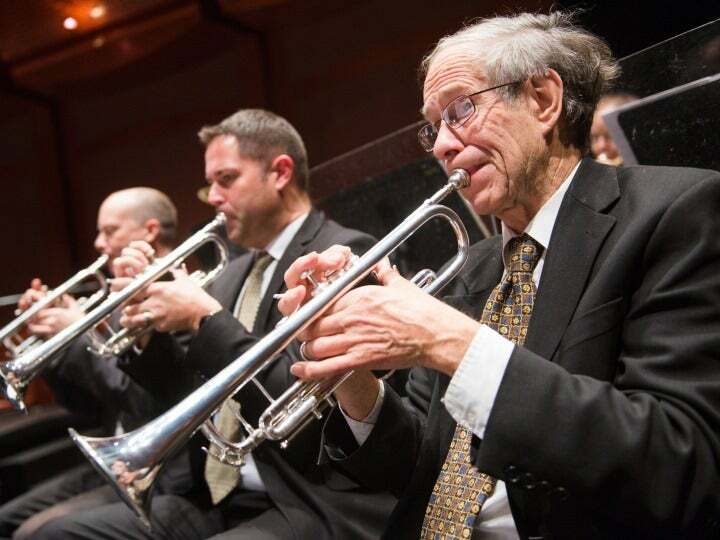 A native of northern Minnesota, New Jersey Symphony Orchestra trumpet player DAVID LARSON received a Bachelor of Science degree in Instrumental and Vocal Music from Bemidji State University in Minnesota and a Master of Music degree in trumpet from Indiana University, where he studied with Herbert Mueller. While in high school, Larson performed solo trumpet on the “Original Ted Mack Amateur Hour” in New York. He was also a member of the National Orchestral Association of New York (where he received the Outstanding Musician’s Award) and participated in the Aspen Music Festival for seven summers. Larson has studied privately with James Pandolfi of the New York Metropolitan Opera Orchestra, Edward Treutel of The Juilliard School, Robert Sullivan and Vincent Penzarella of the New York Philharmonic and former Seattle Symphony Music Director Gerard Schwarz. He maintains an active teaching studio; his students have achieved high honors in state and national competitions and have continued their studies at The Juilliard School, Oberlin Conservatory of Music and other distinguished institutions. Outside of music, Larson enjoys photography, gourmet cooking, scuba diving and traveling, with a partiality towards Norway, his wife’s country of origin.